AC Network & Theorems Experimental Set – up, is versatile and useful educational training equipment for both the electrical & electronic branches of engineering? It is one of the many specialised training equipments from the house of “Adtron – the training people, who have over a decade of experience in manufacturing educational training equipments and teaching aids. AC Network & Theorems Experimental Set – up, is useful for the study and practical verification of Electrical / Electronic Networks & Theorems with AC supply by using R, L & C parameters (elements). The experimental set – up is compact and self – contained and comes with a comprehensive instruction manual with explains all relevant information with experiments in simple and easy to understand terms. The students can be led step by step for verification, which will promote better subject understanding capabilities in the future. * Ideal tool for learning basics of theorems applied to AC Network. * Mains operated, self – contained system. * Power supply provided with phase shift device to obtain desired phase difference. * Proper safety precautions provided. * Built – in precision RLC components and metes, to provide data verification along with power factor measurement. The following experiments can be performed using the built – in dedicated theorems circuit with RLC components. * Maximum Power Transfer Theorem. * Kirchoff’s Current Law ( KCL ). * Kirchoff’s Voltage Law ( KVL ). a. Variable resistance upto 100 ohms / 2.5A in incremental steps : 01 Nos. b. Variable inductance upto 600 mH / 2A in incremental steps : 03 Nos. c. Variable capacitance upto 50 f / 250V in incremental steps : 04 Nos. ( capacitance are fitted with discharge resistors for protection ). Note : The above elements are incorporated in the various dedicated theorems set – up as per requirements of the theorems. Input : 230 V AC, 50 Hz, single phase. Protection : MCB switch for both output and separate indicating lamps for mains ON. b. A separate voltage source with facility for phase shifting of voltage is provided. All analog ammeters are of + 0.5 % accuracy, class 0.5 precision grade type. All other analog meter are of + 1.0 % accuracy, class 1.0 grade type. All analog meters are permanently connected in the circuits as per the theorem requirements. a. The circuits are arranged separately for verification of respective theorems. b. 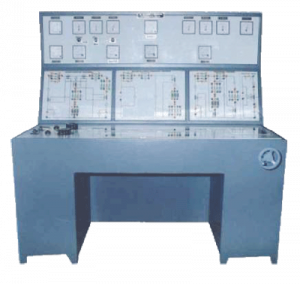 The front panel is provided with proper mimic including required meters, test points and proper terminations of the R, L & C parameters. c. Facility of detecting reverse flow of current during verification of Super Position Theorem is provided. d. The circuits are assembled in proper panel type metal enclosure. i. P. F. meters to measure phase difference in terms of COS . ii. Facility of detecting reverse flow of current in that branch. i. Original network containing R, L & C elements. ii. Equivalent voltage source with desired phase shift for VTH. i. Wattmeter, Ammeter & Voltmeter permanently connected in circuit. 1. Kirchoff’s Current Law ( KCL ). 2. Kirchoff’s Voltage Law ( KVL ). 1. Capacitors are fitted with discharge resistors. 2. Supply line inputs is protected by MCB. 3. Necessary terminations, switches and control are provided in each circuit as per the requirements for proper operation. 4. Connections by 4 mm colour coded binding posts. * A detailed, comprehensive & well illustrated instruction manual is provided. Being an experimental set up, the importance is given to the understanding of the various theorems by giving the facility, to perform the experiment at different sets of parameters, where by the tolerance level between the theoretical & practical results will be in the range of 20 %, as the values of L and even to some extent C will change under different conditions of voltage, current and temperature.